We have been meaning to finally send an update. First, the Denmark chapter is over, so we thought we might post a new album (Gallery > Denmark). We definetely have had a good time there. We will be coming back, maybe for a tour around Teltpladsen, we really liked that, but didn’t have the opportunity to test the sheds. – “Hej, Hej”: Everybody was just so friendly. It’s really nice to be greeted (“Hej,Hej”) by nearly all bypassers. – Copenhagen bicycle city: Wow, tricycles (Jernhest, Bullit, Christiania, Nihola), workcycles (Omnium), city bikes (Avenue), singlespeeds even “Eco” bikes (Eco2Bike) and the cycling experience was really good too. Funnily, there are about as many cyclists as in any other town in the Netherlands, but it just feels different. More easy going, less get-out-of-my-way from other cyclists. 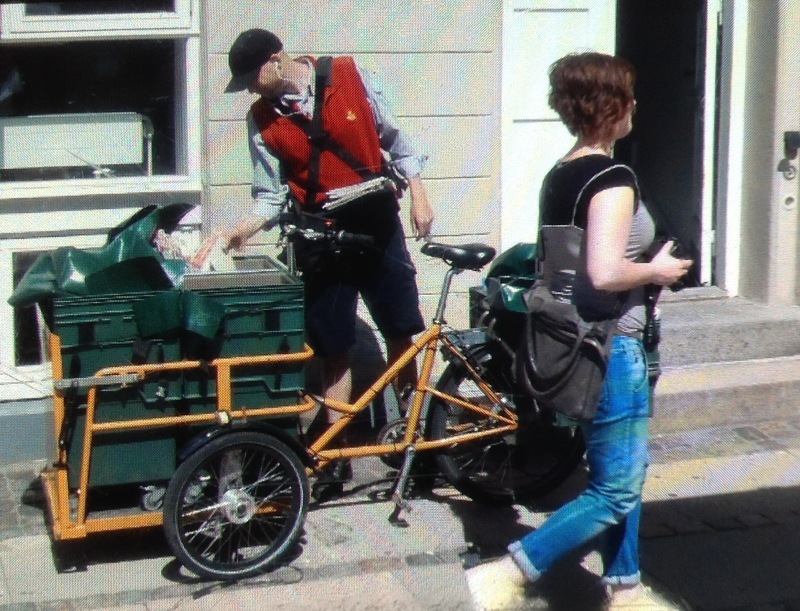 And so much faster: cyclists zip round the city… The postmen had, of course, their own cargo tricycles. -Flag (and flag pole)-dealers aren’t about to be out of business soon. 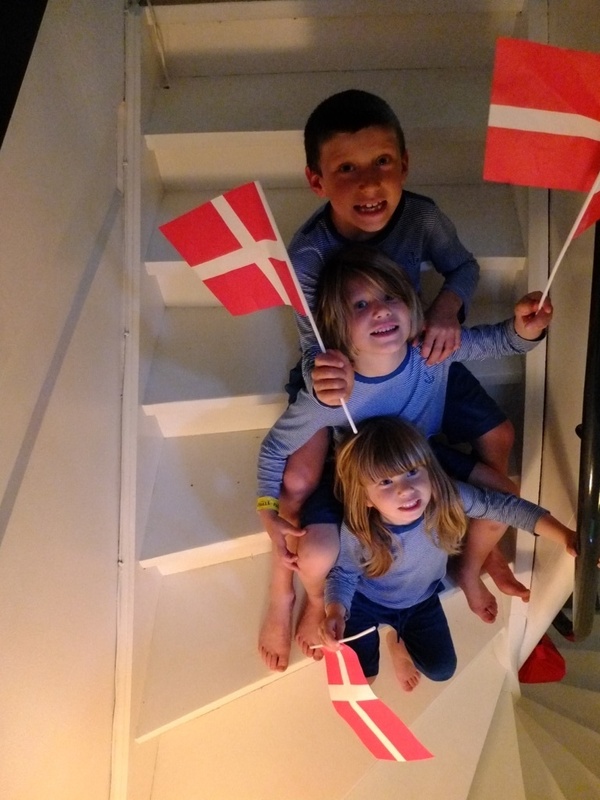 Danish flags are up and flying everywhere! Every self-respecting Dane should have one in the garden (should I put up a small flag in Brussels?). For birthdays and special occasions they’ll hoist a bigger flag, but only between sunrise and sunset. 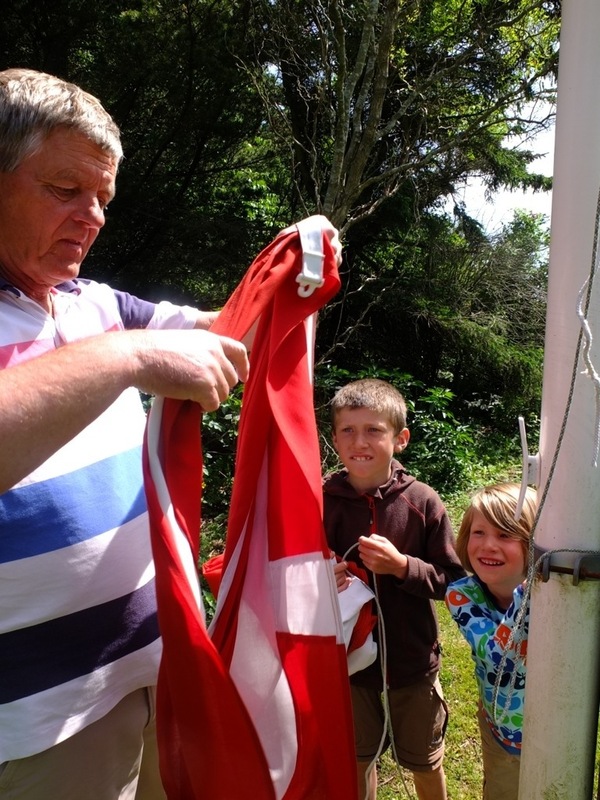 Miro and Smilla got to up the flag at Jonathan’s uncle Peter. -Youth hostels are another thing to remember. We really enjoyed staying at them in Denmark (they are of course called Danhostels) besides the camping. And always a nice breakfast, but why are they mostly on top of the hill? The name of the Ebletoft Danhostel subtitle says it all: KOM PÅ TOPPEN! 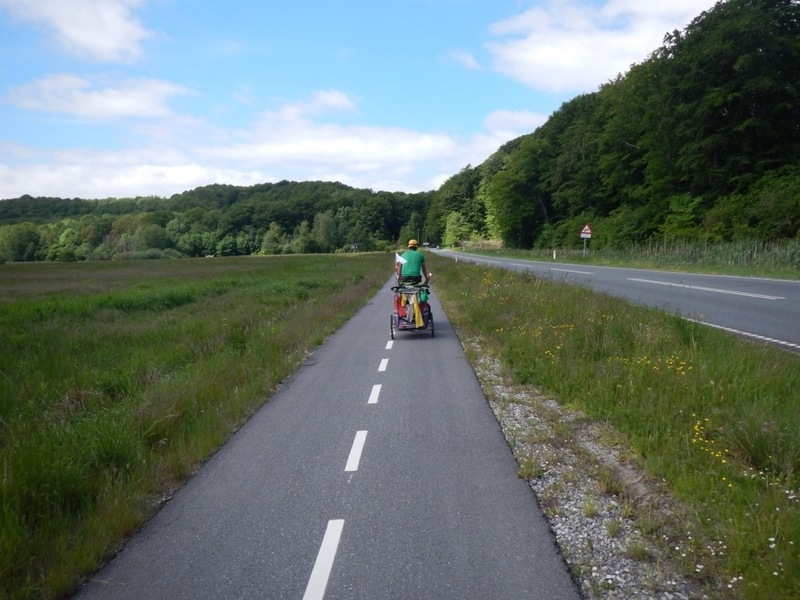 -The cycling was really good, often on seperate cycling paths and really big ones. When we did ride on the roads, motorists were (nearly) always very careful and friendly. The highest point in Denmark is only 100-something meters, but don’t be fooled: Denmark is not flat. Always gently undulating, but steep enough to have a hard time on heavily loaded cycles. 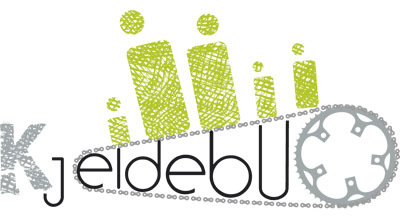 Our average speed dropped from 13-14 km/h in Belgium-Netherlands to 11-12 km/h. 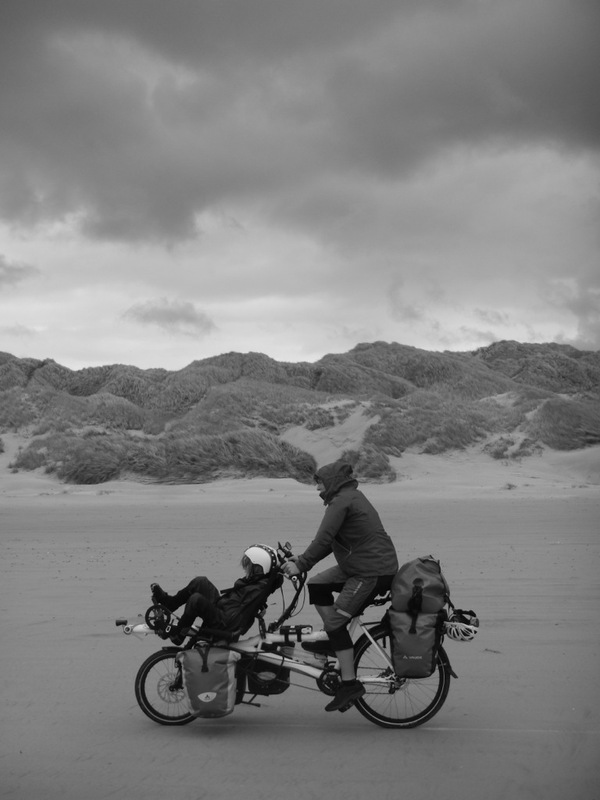 One of the memorable rides was a 4 km stretch of beach we rode in stormy weather, luckily tail-winded all the way. Later that day Smilla fell asleep on the Pino for the last half hour. And of course, it was wonderfull to see part of our family again after so long time! We hebben uw tocht van dichtbij gevolgd. HEROISCH? zou ik zeggen. Kom behouden terug, natuurlijk. Binnenkort komt Christophe ons bezoeken.